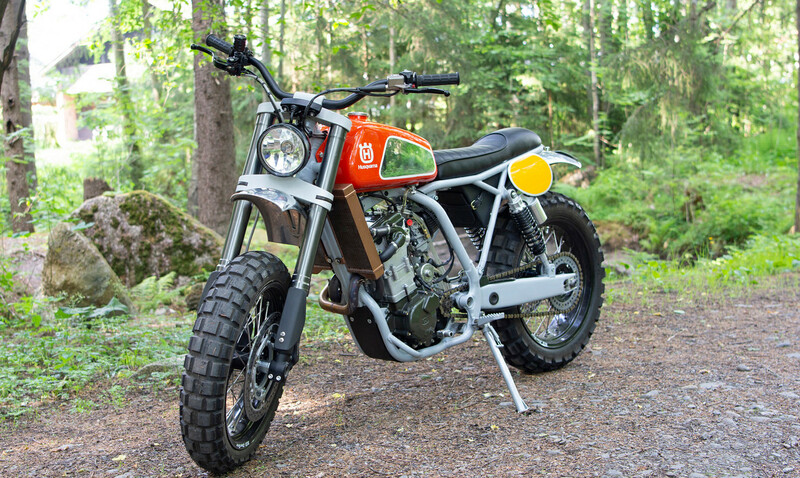 The Husqvarna SMR 510 was a replica of the Swedish company’s championship-winning supermoto race machines — a lightweight (240-lb), high-powered (60-hp), water-cooled street weapon with top-notch build quality. Enter Panu Laakkonen of KMPH Oy (Kalevan MP-Huolto Oy), a motorcycle service and repair shop in Tampere, Finland. 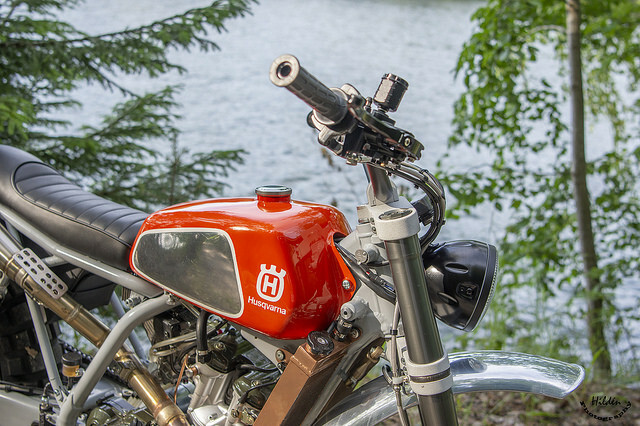 Panu decided to build a modern Husky scrambler that resembled the Husqvarna bikes of old, complete with a CR360 tank. 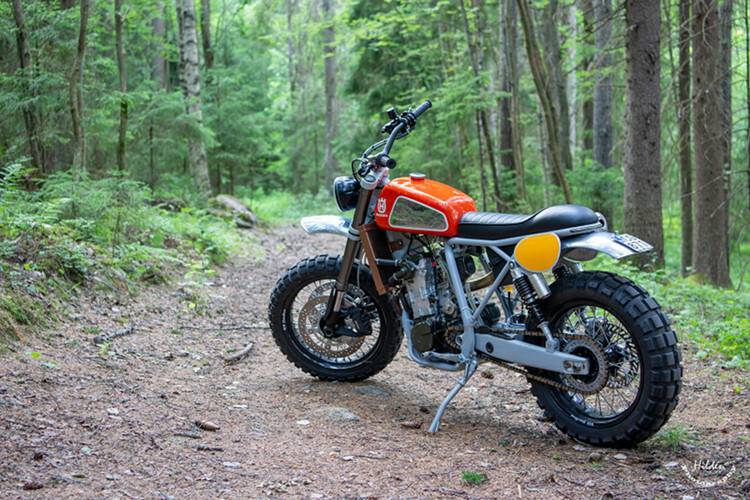 This Husqvarna scrambler, nicknamed “Trail27”, is simply one of the finest modern scrambler builds we have ever seen. From the handmade copper and brass radiators (!) 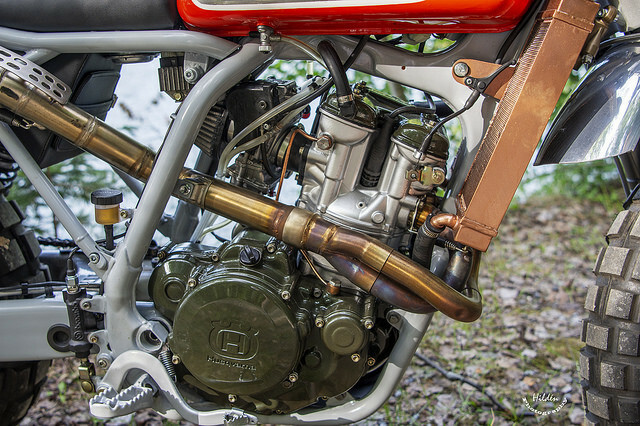 to the custom dual-shock setup to the tig-welded subframe, “Trail27” is a true showstopper and tribute to the Husky enduros of yore. Below, we get the full story on the build. 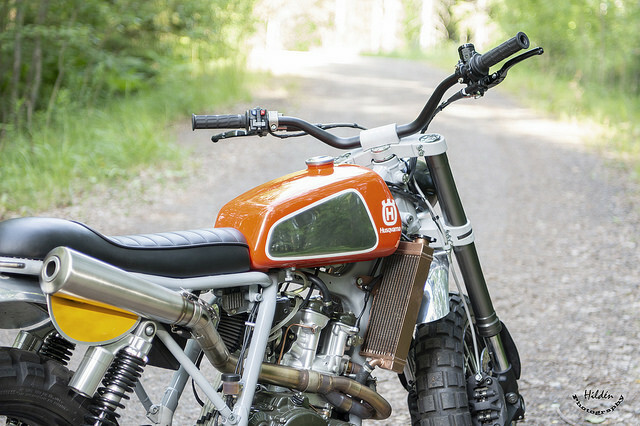 Please tell us a bit about yourself, your history with motorcycles, and your workshop. I’m 34 years old, a father of two who gets inspired designing and manufacturing parts and building whole bikes. 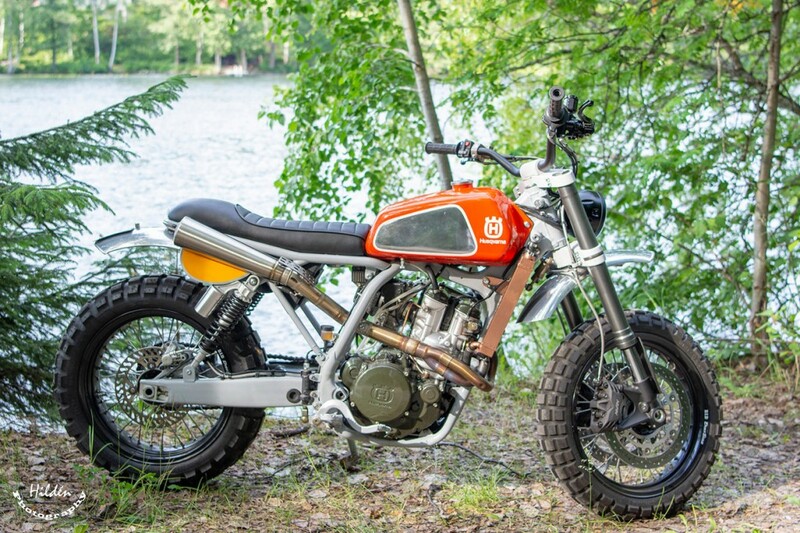 I was 15 when I got my first “bike” — Honda Monkey 50 — and from then on bikes have been a big part of my life. I studied environmental engineering but had this hobby of building and repairing mine and my friends bikes. One day when I was visiting a local shop for parts the owner offered me a job and without thinking I took it. I worked couple years as a mechanic and then first bought small part of the company and a year later the rest of the company. My workshop KMPH Oy (Kalevan MP-Huolto Oy) is a small business all about motorcycle service and repairs etc. But because of my true desire to build bikes I have been doing all kinds of modifications and builds during these years. 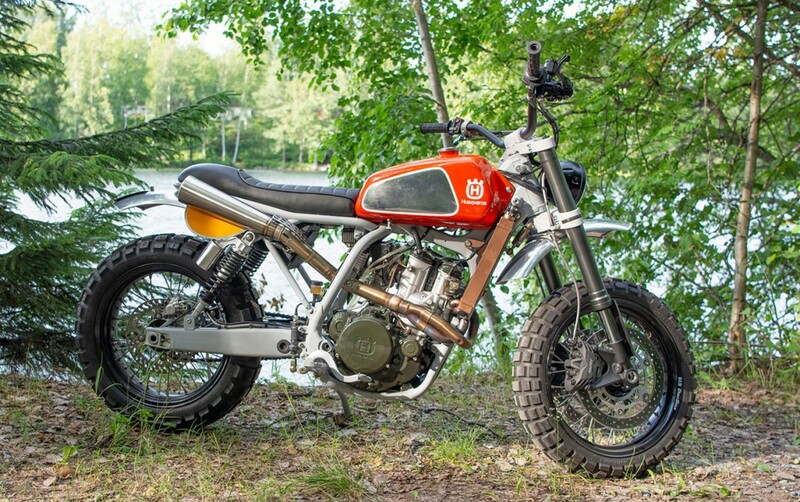 What’s the make, model, and year of the bike? What was the design concept and what influenced the build? This build started as a bike that I would build from the scratch and then sell it to someone. But even before I had the donor bike, I already had an old customer of mine showing huge interest of the bike because of the brand he had been racing in the 70´s. 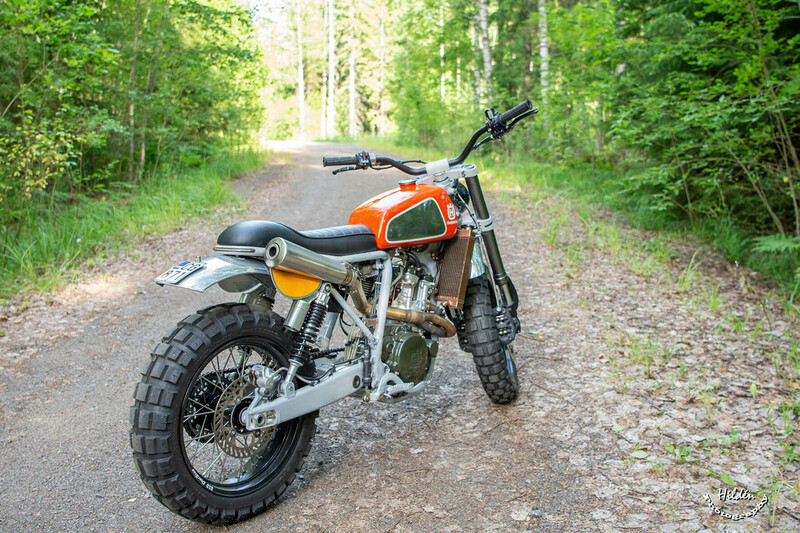 Concept was to make a scrambler that would resemble old Husqvarna bikes. The first part that I bought for this bike was the tank from Husqvarna CR360. 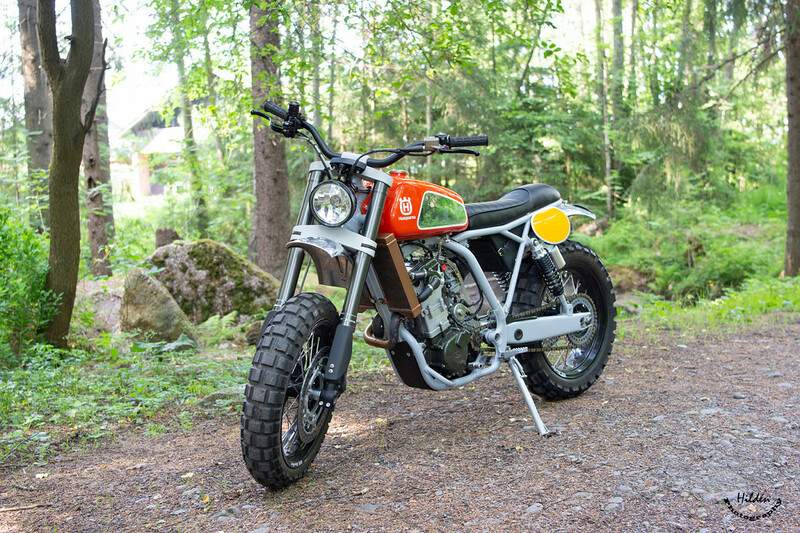 And after that the things with the customer started to come together as he then showed me pictures of him competing in “Päijänteen ympäriajo” (https://www.paijanne-enduro.fi) with his ’76 Husqvarna with the same tank. 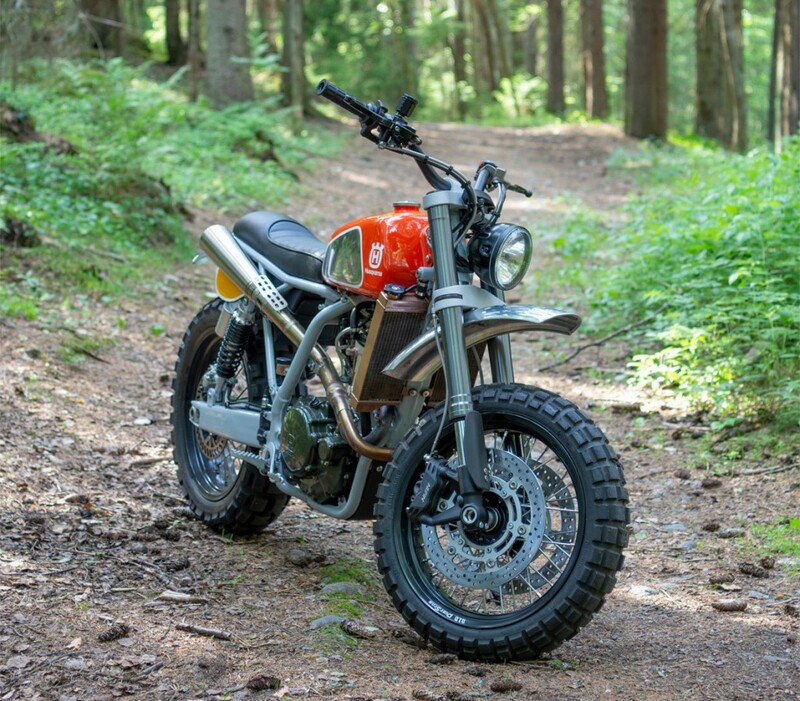 So the bike was picked because of its nimble frame and powerful engine and because I have many years of experience with Husqvarna bikes — the choice was easy to make. 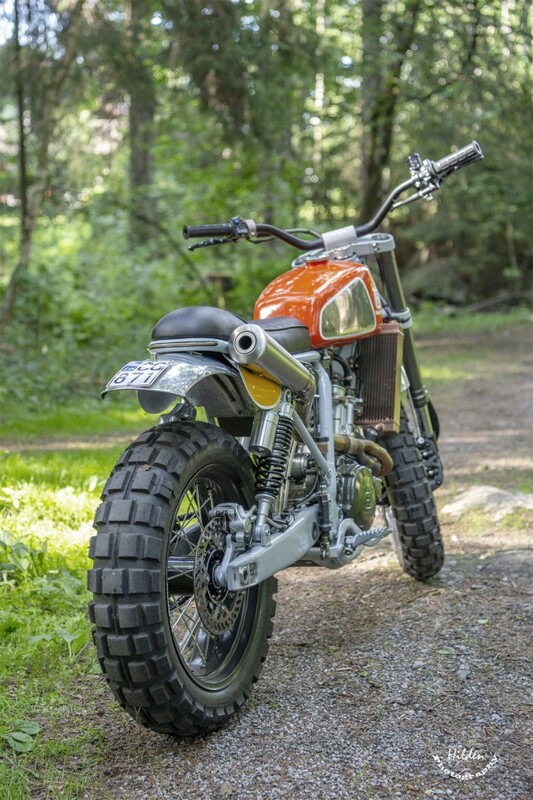 What custom work was done to the bike? Frame had only minor changes (coolant tube goes threw the frame) and the engine has been rebuilt. Swing arm is original but it has been shortened 4 cm for aesthetics so I could make the shift from mono shock to stereo and to have better protection for the bearings so the old engine and swing arm mount was taken off and new bases for the bearing was tig welded on. Radiators are hand-made from copper and brass following my design. 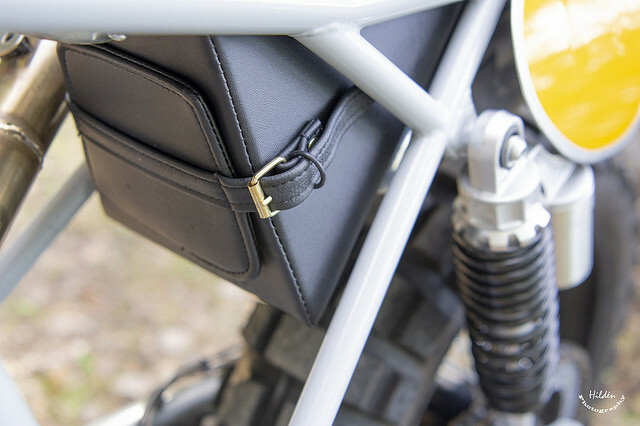 Sub frame is made from tube and tig welded with a insert for the rear light with blinkers. Base of the saddle is welded from pieces of plastic PEHD. And from the same plastic I made the fork protectors and engine protector and these are sand blasted. 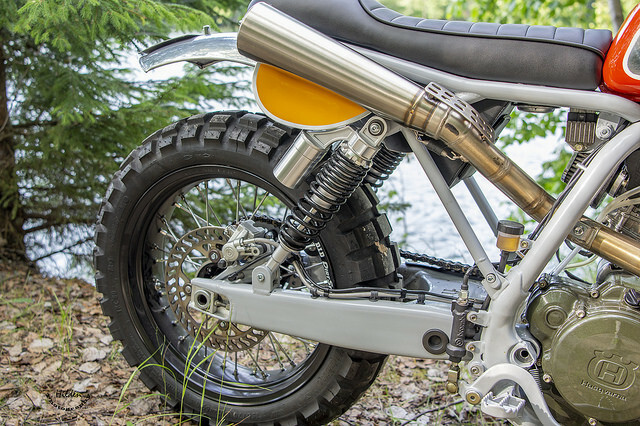 Rear hub is Husqvarna’s own with new 17″ rim and spokes. 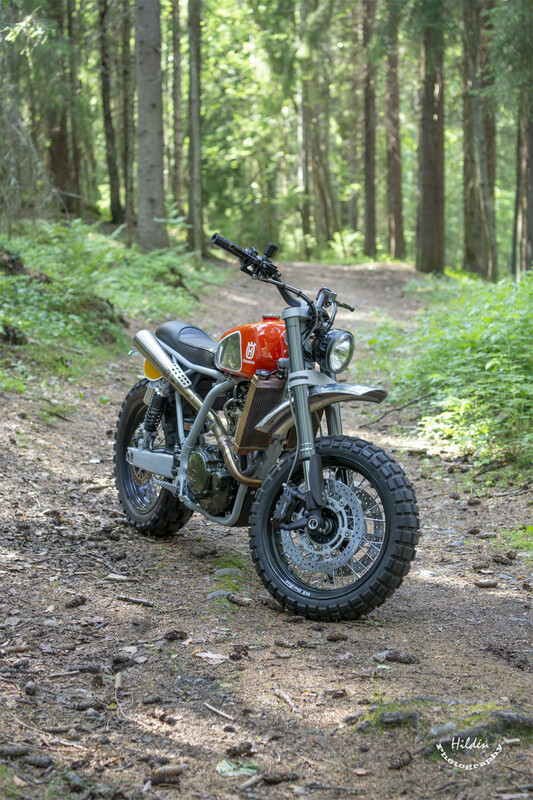 Front hub and brake discs are from KTM 950 adventure and I paired them with a 17″ rim. Front end is from Kawasaki ZX6R 2012 and the triple trees are made from my 3D design by Ape (apesmetalshop.fi). Parts are sand blasted before anodizing to make them have this old look. Aluminum fenders are fitted for this bike. Head lamp and gauge holder is my own design as well. Whole wiring harness is made by me and is fitted under the tank including the battery (durbahn.de) only ECU and voltage regulator I had to place elsewhere. 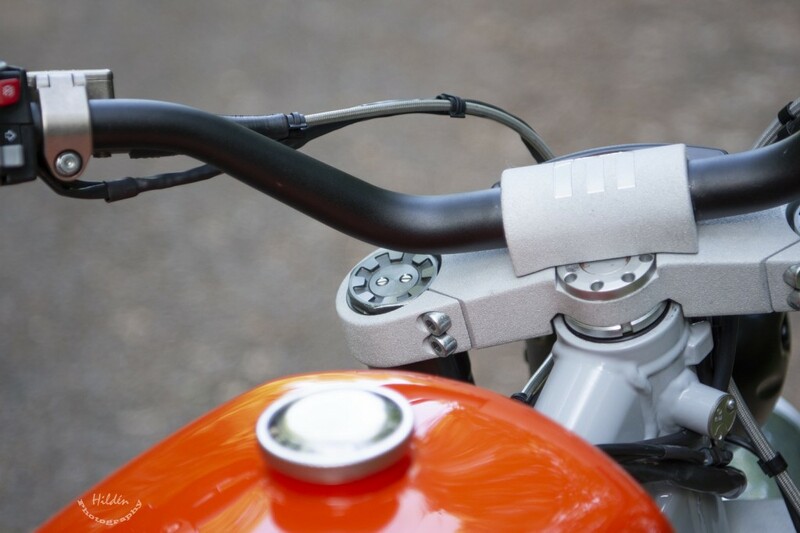 Front blinkers I made myself and they are inserted inside the bottom yoke. Exhaust is made from stainless steel and there are some old parts that I used and some new tubing with stainless steel silencer with noise-killer made from aluminium with lathe. 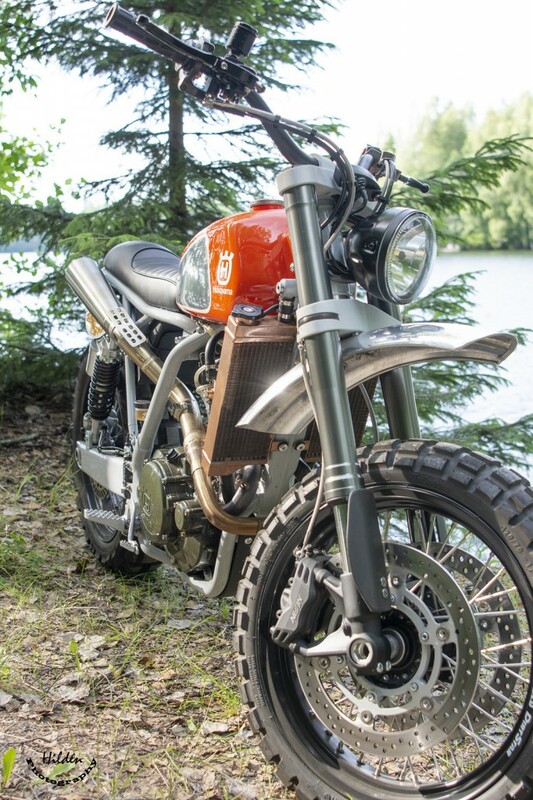 How would you classify this bike? 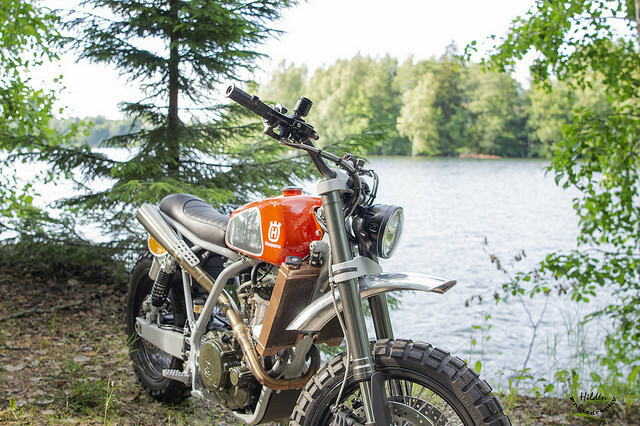 Bike I would classify as a scrambler. 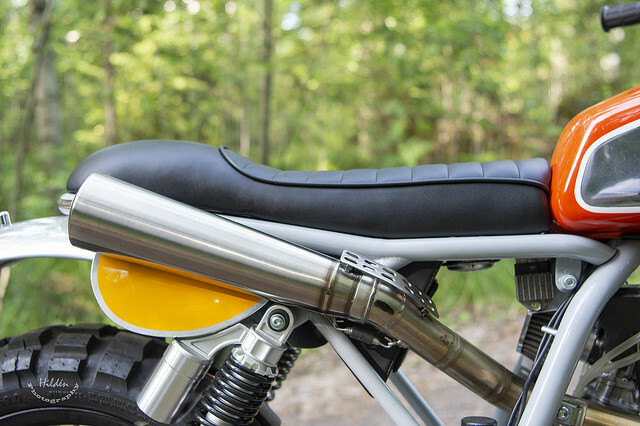 but for more of a cafe racer style riding. Was there anything done during this build that you are particularly proud of? Mostly I’m proud of how I captured essence of an old bike. What is the Motorcycle in Venom? 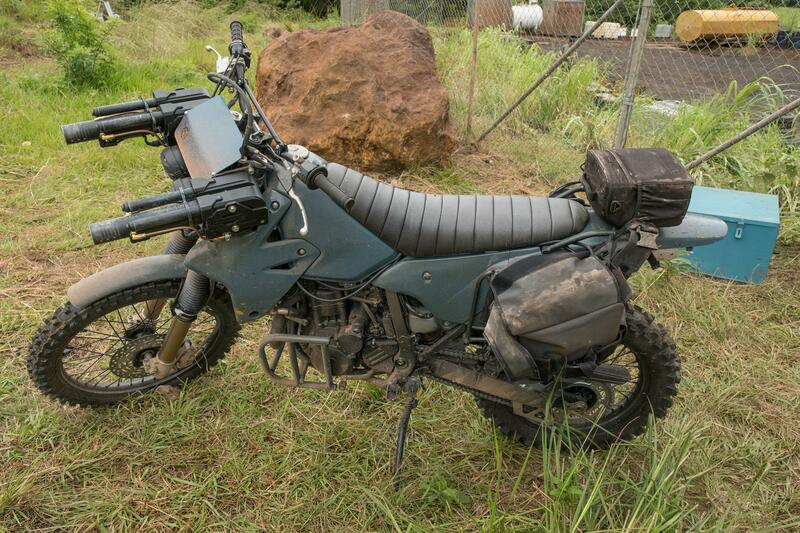 What are the Motorcycles in Jumanji?